Hiya Lovelies, welcome to Christmas week! What did you all do last weekend? Eric and I went present shopping all day Saturday, and then spent Saturday night making chocolate covered pretzels with Jenny. She came over to assist me (let's be honest, she led me around the project!) in making a ton of fun chocolate covered pretzels to give to Eric's fam for Christmas. 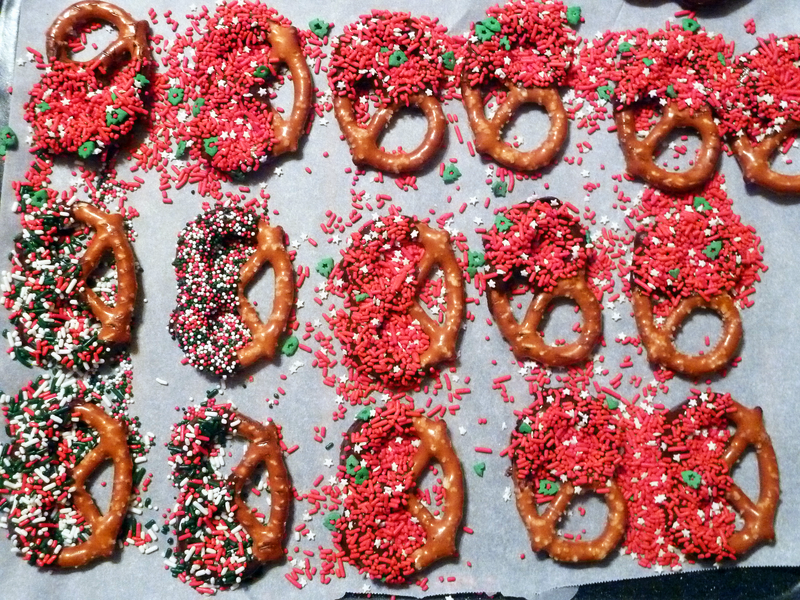 We ended up literally filling my kitchen full of pretzels! It was such an easy and fun food-craft to do on a Saturday night (oh, and we ended the night by watching/singing along to Taylor Swift videos: perfect Saturday night.) 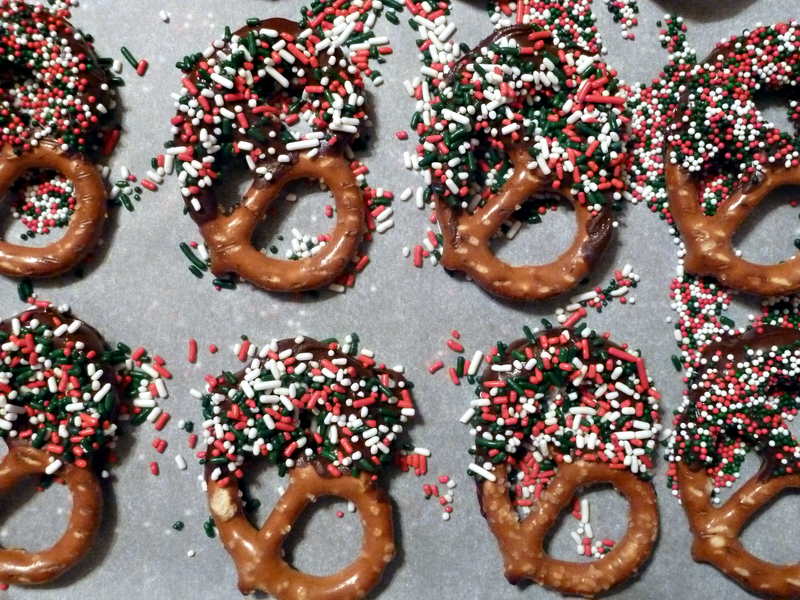 How do you concoct these pretzels? Easy as 1, 2, 3! 1. Buy chocolate chips, pretzels, and anything you'd like to sprinkle on them. 2. 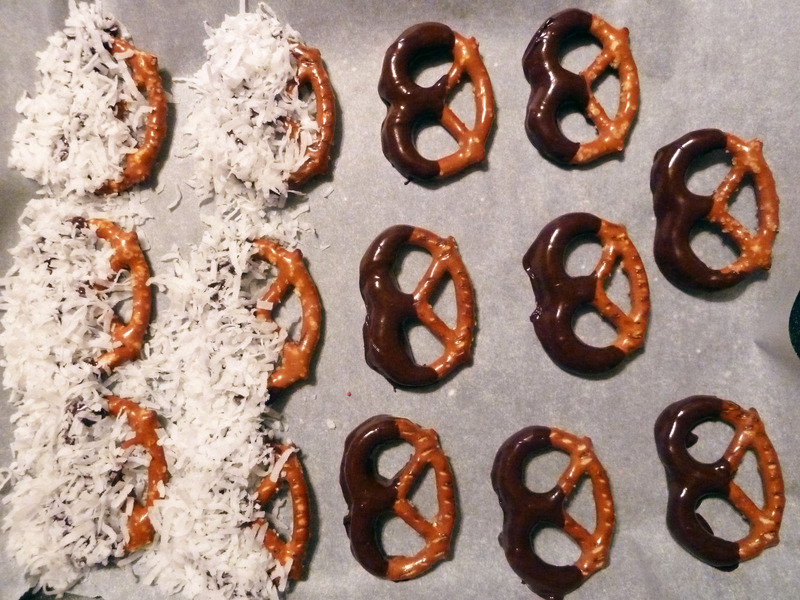 Melt the chocolate, and dip the pretzels in (I only did half the pretzels, instead of the whole thing. It was easier, used less chocolate, and I think, looked nicer). 3. 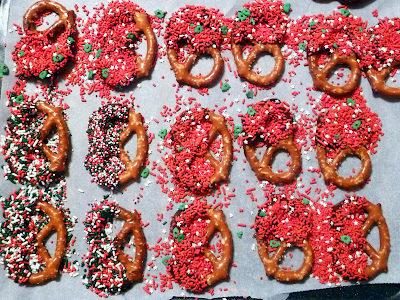 Lay the pretzels out on a tray with parchment/wax paper and sprinkle any toppings on them. Let them sit out to dry (or stick them in the fridge for a bit), and you're done! I'm packaging mine up in holiday tins, but you could easily put a few in some cellophane and tie them up with a ribbon. This was so easy to do, and they look really, really nice when they are done! (I'm going to try this with cookies next time, too!) 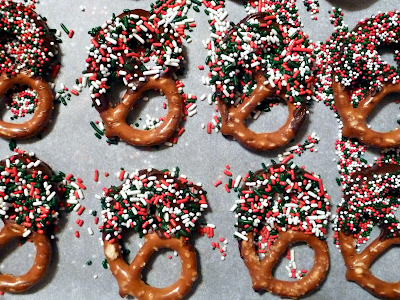 Take a peek at what we made, we topped them with sprinkles, coconut, and kept some plain, too. I would love to nibble on what's left over on the parchment sheet afterwards.